Start Valentine’s Day sunny side up (or over easy) with one of these ten romantic Valentine breakfast ideas. 1) Heart Shape Fried Egg. For this easy morning smile maker, you’ll need a heart-shaped cookie cutter, a frying pan, an egg and some cooking spray or butter. Frying an egg in a heart-shaped cookie cutter. Spray the pan, and the inside of the cookie cutter, with cooking spray or grease with butter. Place the frying pan on a stove burner set to medium heat. Place the cookie cutter in the center of the pan. Crack the egg into the cookie cutter and wait for the egg to set. Martha Stewart: Bread toasted in a pan, with eggs cooked in the heart-shaped center hole. Don’t worry about any egg white which might spread beyond the cookie cutter. You can easily pry it away. If you want the eggs over easy, or cooked hard, remove the egg from the cookie cutter and flip the egg over to finish cooking as you like it. 2. Heart-Shaped Eggs and Toast. The very simple version of this is to make a slice of toast while you’re frying the egg, as above. Use the same size cookie cutter to cut an opening in the center of the toast. 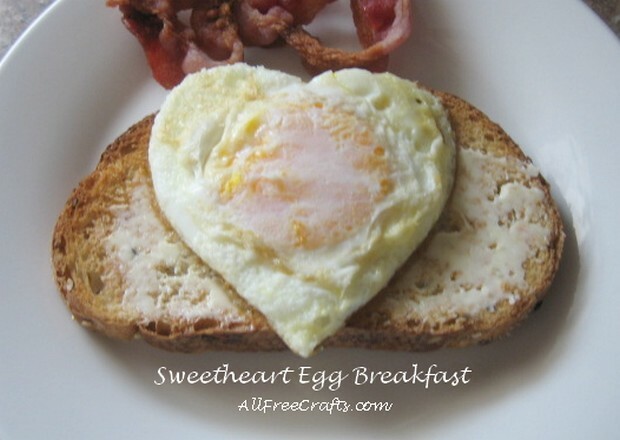 Once your egg is cooked, slip it into the made-to-size heart shape. 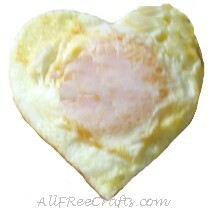 Or you can make two eggs and slide the other one onto the heart-shape toasted cut-out. Martha Stewart has a cute variation of the heart-shaped fried egg; in her version, you fry the egg inside the cookie cutter which is set inside a piece of toast. 3. Heart Shaped Baked Eggs. If you hate cooking, you’ll find a kindred spirit at MommyHatesCooking.com, where you’ll find this super simple way of baking eggs in a heart shaped muffin tin. 4. Heart Shaped Boiled Eggs. Fresh, boiled eggs can become heart-shaped with a little help from the corner of a milk carton, a chop stick and two rubber bands. Check out this video on How to Make Heart-Shaped Boiled Eggs. 5. Bacon, Egg and Heart-Shaped Toast Cups. Jaymee Sire shows how to make these enticing bacon, egg and toast cups baked in heart-shaped muffin cups to tasty perfection. 6. Heart Shape Mini Omelettes. These little egg omelettes, with grated cheese and bacon bits, were cooked in heart-shaped pancake molds in a frying pan. I imagine that cookie-cutters would suffice in a pinch. So there you have it. Even if you forgot a Valentine’s Day card, you probably have all you need in the fridge to say “I Love You” with eggs.